If you take your training seriously, you’re going to need protein. A lot of it. Studies have proven that protein is essential to building lean mass and muscle. That’s because our cells need protein to kickstart protein synthesis, which is needed for hypertrophy, the process cells use to heal and grow muscles after being broken down through exercise. You probably get plenty of protein in your diet, especially if you eat meat. Still, you probably need more. The National Strength and Conditioning Association (NSCA) general recommendation for athletes is 2 to 2.0 g/kg of body weight per day, with people training specifically for muscle growth needing even more — which means you’ll probably need to turn to supplements to get enough for your gains. This isn’t just bro science, either. Peer-reviewed studies have shown that supplements can give your muscle mass and performance a boost when you put in the work, so those big tubs filled with the powder aren’t just for show — there’s a lot of good stuff in there. Check out these six varieties of protein powder that you can toss in recipes, smoothies, or just your trusty shaker bottle. Whey is the consensus-MVP protein for building muscle, so if you can swing it, make sure you’re taking the good stuff. Ascent’s powder is made using native whey, which the company calls the “least-processed” form. There are 25 g of protein per serving and 0 artificial ingredients, so you’re getting the good stuff. If you care about where your food comes from, this is the supp for you. The whey is certified organic from grass-fed cows — plus, there are probiotics to help fuel digestion. Opt for this powder if you want a longer, more sustained result from your supplement. 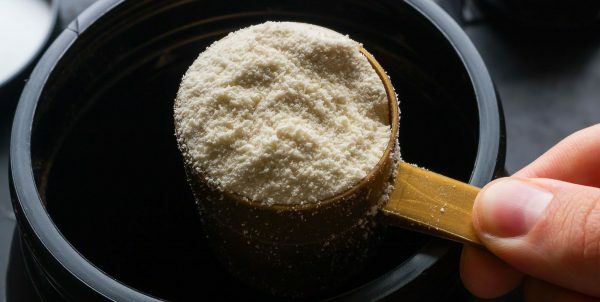 The company claims its affects are spread out over the course of 8 hours, since there are seven different sources of protein, including slow-digesting casein. You’re not out of luck if you’re lactose intolerant — you can still reap the benefits that come with whey protein with whey isolate. This supplement from Dymatize gives you 25 g of the good stuff per serving, low lactose and, best of all, a range of flavors to choose from. Protein isn’t just for the carnivores among us. There are still options for those that choose not to consume animal products, like this supp from Vega Sport. Its mix of peas, pumpkin, organic sunflower seeds, and alfalfa is vegan certified, and offers 30 g of protein per serving. Pea protein has made waves in recent years as another vegan-friendly alternative to whey, since the veggie is a rare non-meat complete protein (which means it contains all nine of the essential amino acids). This best-selling option offers 24 g per serving. Brett Williams is an Associate Fitness Editor at Men’s Health.